On his first voyage,Gulliver goes to the sea as a surgeon on a merchant ship. 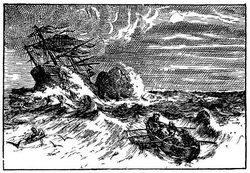 The ship is destroyed during a storm with Gulliver being the sole survivor. He swims to a nearby island of Lilliput and being exhausted falls asleep. 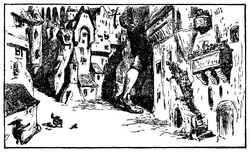 Upon awakening, he finds that the island's inhabitants, who are only six inches tall, have captured him and he is a prisoner of the Lilliputians. 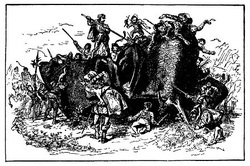 The inhabitants are curious about Gulliver and provide him with food. 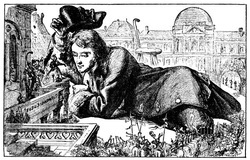 The Emperor of Lilliput then orders Gulliver to be moved to a little-used temple, where he is kept prisoner. Gulliver's co-operation and friendly nature pleases the Emperor. After giving assurances of his good behaviour, Gulliver is freed and given a residence in Lilliput. He soon becomes a favourite of the Lilliputian court. Play after 45 seconds (movie credits) - Nice extracts from the Movie which is a nice adaptation of the book. 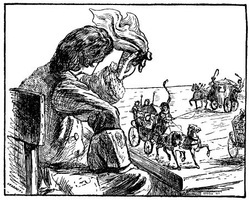 Gulliver then describes the various Liliputian court customs and other diverisons. He also gets to know more about the cause of conflict between the neighbouring and rival countries of Lilliput and Blefuscu. 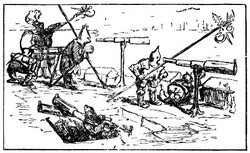 Gulliver assists the Lilliputians to subdue their neighbors, Blefuscudians by stealing their fleet. However, he refuses to reduce Blefuscu to a province of Lilliput, thus displeasing the King and the court. A fire breaks out in the royal palace and Gulliver puts out the fire by urinating on it.There is a law against anyone passing water in the royal palace, however, the Emperor later pardons Gulliver for this crime. 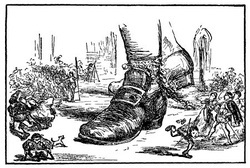 Gulliver later provides details about the Lilliputian culture and laws. The Emperor and his family come to visit & dine with Gulliver. The royal treasurer with them is appalled when he estimates the cost of feeding Gulliver. He also accuses his wife of being attracted to Gulliver and having visited him secretly. 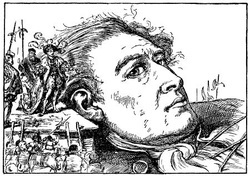 Gulliver learns that he is to be charged with treason for various crimes and sentenced to be blinded. On learning this, with the assistance of a kind friend, Gulliver escapes to Blefuscu. He later spots and retrieves an abandoned boat and restores it. 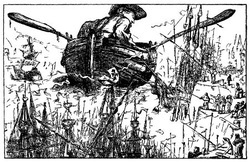 Gulliver then sails out to be rescued by a passing ship which safely takes him back home. This classic book has had modern interpretations to fit into our current culture. The latest one is the 2010 Movie with a comical twist. Here Gulliver, a lowly mailroom clerk at a New York newspaper. He bluffs his way into an assignment writing about the Bermuda Triangle, he goes there only to be transported to an undiscovered land, Lilliput. In this fantastical new world, Gulliver is, at last, a bigger-than-life figure -- in size and ego, especially after he starts telling tall tales, taking credit for his worlds greatest inventions, and placing himself at the center of its most historic events. Gulliver's position is enhanced even further when he leads his new friends in a daring battle against their longtime enemies. But when Gulliver loses it all and puts the Lilliputians in peril, he must find a way to undo the damage. Ultimately, Gulliver becomes a true giant among men only when he learns that itfs how big you are on the inside that count. Meet the modern version of the Lilliputians in this this video! Scroll down to browse through these beautiful illustrations of Gulliver's travels in Lilliput. If you are interested in the history of Lilliput go to Lilliputian History, Politics & Culture . Click on the images below to watch videos & read more about Gulliver's Travels. Watch the video of beautiful Illustrations of Gulliver's Travels in Lillliput set to music. 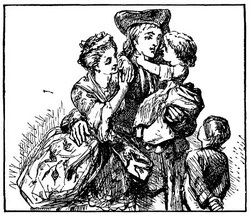 Gulliver gives some account of himself and family. His first inducements to travel. He is shipwrecked, and swims for his life.Gets safe on shore in the country of Lilliput. Is made a prisoner, and carried up the country. 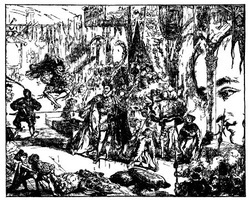 The emperor of Lilliput, attended by several of the nobility, comes to see Gulliver in his confinement. The emperor's person and habits described. Learned men appointed to teach Gulliver their language. He gains favor by his mild disposition. His pockets are searched, and his sword and pistols taken from him. Gulliver diverts the emperor, and his nobility of both sexes, in a very uncommon manner. The diversions of the court of Lilliput described. Gulliver has his liberty granted him upon certain conditions. Mildendo, the metropolis of Lilliput, described, together with the emperor's palace. A conversation between Gulliver and a principal secretary concerning the affairs of that empire. 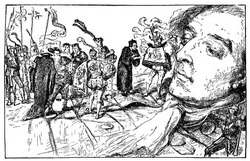 Gulliver's offers to serve the emperor in his wars. 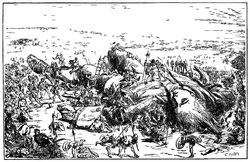 Gulliver, by an extraordinary stratagem, prevents an invasion. A high title of honor is conferred upon him. Ambassadors arrive from the emperor of Blefuscu, and sue for peace. Of the inhabitants of Lilliput; their learning, laws, and customs; the manner of educating their children. Gulliver's way of living in that country. His vindication of a great lady. Gulliver, being informed of a design to accuse him of high treason, makes his escape to Blefuscu. His reception there. Gulliver, by a lucky accident, finds means to leave Blefuscu; and after some difficulties, returns safe to his native country. You can now get more details on Lilliput's history, culture, politics & satire, view more Lilliput illustrations by Grandville & Otto Ernst, Watch videos of Lilliput pictures set to music . Click on the images below to watch videos & read more about Gulliver's Travels.